This large, beautiful luxury town home in Northeast Harbor is one of two town homes located on a 1/3 acre parcel of property. Elegant comfort and a quiet edge of town location are all wrapped up in this lovely property in Northeast Harbor. The gracious front porch leads to a living room with a granite fireplace (gas fired) and adjacent dining room. Large family room, fully equipped kitchen, full bath, window lined sunroom and a small separate office make up the rest of the first floor. The second floor has 3 bedrooms. Master bedroom has a king bed and bathroom with tub and shower; bedroom two has a queen bed and en-suite bathroom with shower; bedroom three has a queen bed and en-suite bathroom with shower. Full laundry facilities. Private stone patio overlooking spacious lawn makes a wonderful place to relax and unwind. The home is just a few steps from golf, tennis and many of the hiking trails of Acadia. Stunning Somes Sound is just a two minute walk away. Village amenities such as shops and restaurants are right at hand, bike to town, or take a drive along the sound just minutes from your doorstep. **Cleaning is $150. This home will be on the market the summer of 2019. Owner will guarantee 60 day notice that your lease will be honored or in the event of a sale they will refund an additional 10% of the rental rate. It will not be shown more than once a week with 24 hour notice and with your agreement. We will offer a $75 gift card for you to go have some fun during the showing. Just finished our return stay at Belle Clair and it was glorious. The home is a perfect place to relax in after spending the day on the trails. Plenty of room including a great sunroom and outdoor patio. The beds are also super comfortable and the kitchen well appointed in case you want to eat in. A great place for families and couples. Amazing house in the best location... walking distance to town! My family and I stayed in this lovely home for a week in August. Maine is a wonderful place to vacation for tons of hiking and activities for the kids. Northeast Harbour and this home in particular was the perfect spot to call home while exploring Acadia National Park. We hope to return again next summer... one week wasn’t enough time! We loved our time at this beautiful home in Northeast Harbor. It’s extremely well cared for, beautifully furnished, immaculate, and spacious. It was so nice to have a full bath attached to each bedroom. The home worked very well for our au pair and two small children since it has two living areas and a lovely sunroom. Jan was extremely responsive to all of my questions and very accommodating. I was concerned that privacy may be an issue because the home is adjoined to another, but this was not an issue at all. It felt very much like we were in a stand-alone home. As for Northeast Harbor, we really loved this town. We’ve stayed in various towns on the island over the years and this may be my favorite location. The town is large enough that it has a few restaurant and cafe options as well as shopping, but it’s away from the traffic and bustle of Bar Harbor. Still, Bar Harbor is easy and quick to get to, and there’s a carriage road entrance just up the street. We’d love to return to this home. We are so glad to hear things went well and we hope you will return! A nice central location and well appointed house. Especially loved that we could do laundry and dry towels. Wonderful house and it is in such a perfect location! We had such a wonderful stay in this home! 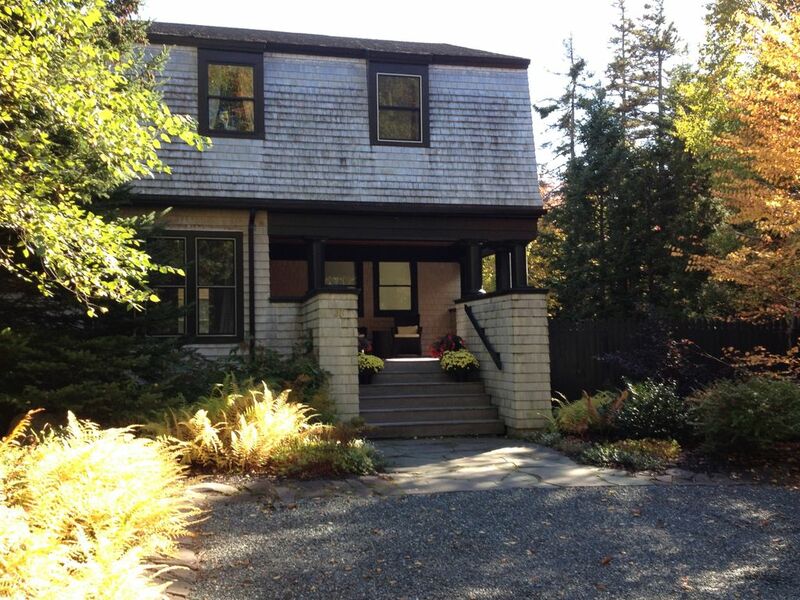 It is in the perfect location- close to Bar Harbor and Acadia National Park. The home was very clean and perfect with our group plus a toddler. Jan was very helpful, kind and always quick to respond if we had any questions! We hope to be back soon! We are happy that our home met all your needs and look forward to your returning! Would stay here again without hesitation. We thoroughly enjoyed our stay at this home. It was clean, well-appointed and very comfortable. It was convenient to Acadia National Park and an easy drive to Bar Harbor. We highly recommend this home. We are so happy to hear your visit met all your needs and expectations! And thank you for taking such good care of our home! Northeast Harbor on Mt. Desert Island is a quiet, quaint village highlighted by a remarkably beautiful harbor filled in the summertime with the spectacular motor yachts and sailing ships of the significant summer population. If you would like large crowds of people, souvenir shops, ice cream stores and countless hotels and B & B’s I would suggest Bar Harbor 15 minutes away. However, Northeast Harbor has a few fine antique shops, several clothing stores, superb art galleries, a few restaurants, a couple of coffee shops, a hardware store, a wonderful grocery store with organic and local foods and one very good all round books/magazines/espresso/candy/Maine memorabilia etc. called McGrath's. We have tennis, golf, a ferry service to the outer islands, a fabulous new library and of course, Acadia National Park with its miles of hiking trails and carriage paths. Many of the walking trails begin within 1 mile of Northeast Harbor.